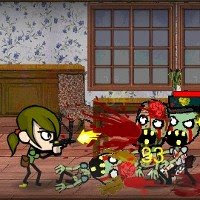 Zombie-killing continues to be one of gamers’ favorite pastimes lately, but few free titles in this genre make blasting brain-hungry undead as fun as Days2Die. Developed by Sudarmin Then of Toge Productions, Days2Die is a shooter/defense that borrows more than its title-structure from the popular console shooter Left4Dead. The graphics and animation by Kris Antoni also deserve special mention – the overall presentation is both cute and incredibly gory, and adds an atypical level of charm to the experience. You start at home, with a lowly handgun, knife, and a pittance of cash. Your ultimate goal is to proceed to a nearby harbor and escape. The first map is simply a one-story structure; however, subsequent levels have multiple floors, keeping the action interesting. Much like other defensive shooters, the player can strategically place barricades that will impede the zombies’ progress. Damaged barricades can also be repaired, provided that the player can reach them before they’re destroyed. The experience is structured similarly to Chris Condon’s (excellent) Last Stand series. Each of the six maps consists of several progressively more difficult “rounds.” Between rounds, you can also buy ammo and as many weapons as you’d like, but you'll be limited to 4 total weapons each round – two guns, a melee weapon, and an explosive. The bottom line is that Days2Die is a must-play. It’s a fast-paced, bloody shooter, with more “braaaiinnnssss” than a Mensa meeting.